It took me quite a while to come up with the “perfect” name for my blog. I would come up with “a great idea” but soon after would determine it was not so great after all – and so on. Finally, in a moment of “brilliance”, I found the name – THE PURE BABY. The Pure Baby, you see, is one of the names that I have for our baby. Usually, I will call him “The Pure Baby” in moments that we see him doing something that we deem extraordinary and wonderful :) At those times, I realize that he is the amazing little baby that he is, because we have kept him pure. After we brought our first baby home from the hospital, I felt so overwhelmed with this great responsibility that had been given to us. I was at home alone with my new baby all day long, while my husband worked. It was a bit scary. I would think to myself that this was our “practice baby”. I kept thinking that this baby would be a learning experience, and I hoped that we would not make many mistakes. Sadly, we made a huge mistake with our first baby. I feel so responsible for this, and I hold an incredible amount of regret and guilt. This mistake changed our family and our lives forever. This mistake has brought great pain to us, and this mistake has cost us a good amount of money. The behaviors and aggression resulting from this mistake have even alienated us from friends and family. This horrible mistake was vaccination. Our first baby received his first mercury-laden vaccination on his first day of life. Hepatitis B. Apparently, newborn babies are carrying the risk factors for that. HA. A bunch of nonsense. I had not educated myself about vaccinations. I just assumed that if a doctor said it was good, it must be. After all, Americans are supposed to worship the almighty doctors, right? At the same time, I had been exposed to a bit of anti-vaccination information during my first baby’s pregnancy. I had checked out from the library, a bunch of Mothering Magazine issues. In at least one, I discovered an article stating that vaccinations do more harm than good. Additionally, my chiropractor put out a newsletter in which she wrote of vaccine dangers, including real live stories of vaccine-injured people. So you see, even though I was exposed to some anti-vaccination information, I did not listen. I did not learn. I let our baby be vaccinated. I let him be vaccinated ever so frequently during his first couple of years. I allowed our baby to be mercury poisoned and vaccine-injured. I let our baby develop autism. Yes, I said develop autism. Our baby was PERFECT when he was born. He was 9 pounds, 10 ounces of beautiful baby boy. He was alert and a very enthusiastic breast feeder from the moment of his birth. Our baby was not born with autism. Our baby was born PERFECT. Our baby’s perfection was destroyed by the intense series of mercury-containing vaccinations that he received, which so incredibly began before he was even a day old. 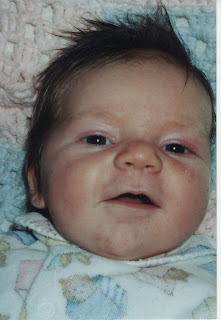 When our first baby was five months old, I began attending La Leche League meetings. At La Leche League, there were a good number of non-vaccinating moms. I’d never met moms like that before, and at first, I thought they were a little weird (to not vaccinate their babies). But, in time, I began to listen. I also subscribed to Mothering Magazine. Between what I learned from my La Leche League friends and Mothering Magazine, I started to question vaccination – a little. I decided that I wanted to separate our baby’s MMR vaccine into the three separate ingredients – Measles, Mumps, and Rubella. I talked to our pediatrician about this. He said it was not necessary and that there was no science behind it, but he agreed to administer the vaccines separately if we spaced them no more than a month apart. When our first baby was 3 ½ years old, we moved to a new state for my husband’s new job. There, we found a wonderful developmental pediatrician who was associated with a major children’s hospital. She evaluated our son and made two life-changing recommendations. First, she said that our son would likely benefit tremendously from The Feingold Diet . I told her that I had previously tried to do a Feingold-like diet with our son, taking out all of the artificial ingredients and buying all of his food at Whole Foods Market. Our doctor said this was not enough. She said that The Feingold Diet cannot be done properly without first buying the materials from The Feingold Association. She said that we needed to buy those materials right away. Then, she said that I should take The Feingold Foodlist book with me to all of the local grocery stores and code the book according to what I could buy at each store. Our doctor’s second suggestion was to take our son to a particular DAN! (Defeat Autism Now!) doctor that she believed would be very helpful to us. We followed her advice. With The Feingold Diet, our son’s behavior improved dramatically. He lost much of his aggression! After a six-month wait for our appointment with the DAN! doctor, we were able to start Biomedical Treatment and begin seeing additional gains in our son! Wow, it was just all so amazing! We were and are so very thankful for our wonderful developmental pediatrician who put our son on the road to recovery! She was the major turning point in our son’s life and ours. As I mentioned already, our son’s autism has alienated us from friends and family. It seems that they have avoided us because they prefer to not experience life with our first child. It is not easy. I know. His first birthday party was a total disaster. A good number of his little friends declined our invitation. Our son dominated the friends that did attend, taking toys away and pushing them down. By his second birthday, our playgroup “friends” told us that we were no longer welcome. At age three, he was discharged from his first nursery school. When we moved to a new state at age three and a half, he qualified for 45 hours per week of state-provided therapy. Our evaluator said that he was the first child that she had found who qualified for such a great number of therapy hours. At age four, our son was discharged from two more nursery schools, again due to anti-social behaviors. We have few visitors to our home. Family tends to stay away, even after the birth of The Pure Baby. I think that our relatives find our first son to be too exhausting and just too much overall. Our son has made tremendous gains through both The Feingold Diet and DAN! (Defeat Autism Now!) Biomedical Treatment. His aggression and “behaviors” have decreased into a shadow of what they once were. Even so, he is not as delightful as a “neuro-typical” (normal) child. He tends to be “clingy” and demands attention. He wants his relatives to play with him and to hold hands with him. He has an intense need to be loved.